LAS VEGAS (Dec. 3, 2010) — Carlos Santana has selected the winning artwork in a t-shirt design contest held among Boys & Girls Clubs of Las Vegas (B&GCLV) Club members. As a resident of Las Vegas, the contest continues Santana’s philanthropic mission to support the local community by enhancing the lives of children. Created by a B&GCLV Club kid, the winning design will be incorporated into a limited-edition t-shirt and sold at The Joint’s merchandise booths and on Santana.com when Santana returns to The Joint at Hard Rock Hotel & Casino in January for Supernatural Santana: A Trip Through The Hits. 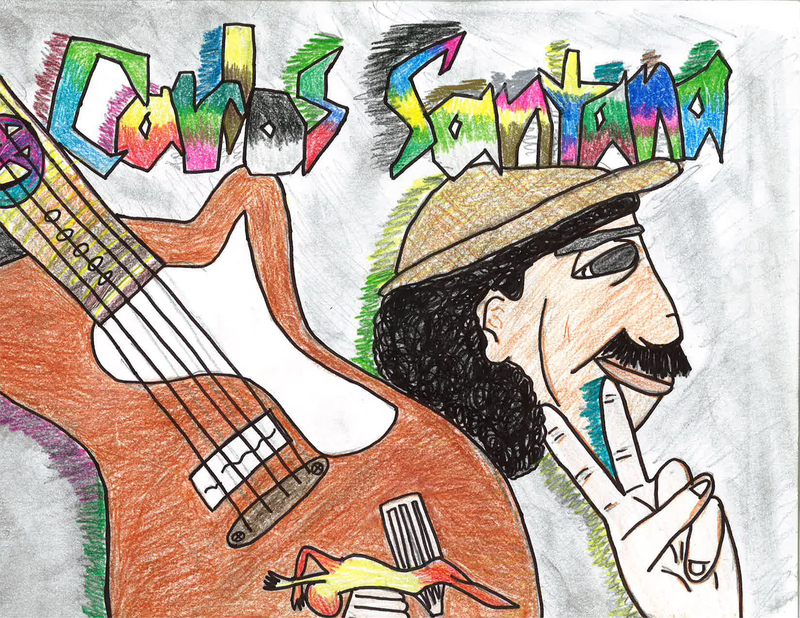 The artwork, created by Imani, age 12 from Lied Memorial Clubhouse, features a colorful rendering of Santana displaying a gesture of peace alongside his PRS Signature Guitar. As the winner of the contest, Imani will get to meet Carlos in person this January as well as attend a performance of Supernatural Santana: A Trip Through The Hits. Additionally, Director of Licensing & Merchandise for Santana Management Dan DeSerpa will talk with Imani about the steps involved in taking her design and producing it on the t-shirts. Held November 1 – 16, the contest was open to all members of the Club ages 11-17. Participants were asked to create a drawing inspired by an image of Santana’s PRS Signature Guitar. Proceeds from the shirt will support B&GCLV. Supernatural Santana: A Trip Through The Hits returns to The Joint January 5, 7, 8, 9, 12, 14, 15 and 16, with additional performances April 20, 22, 23, 24, 27, 29, 30 and May 1. Santana plays approximately 36 shows per year at The Joint, with a show time of 8 p.m. Tickets start at $51 and can be purchased at the Hard Rock Hotel Box Office, all Ticketmaster locations, online at Ticketmaster.com or charge-by-phone at 800.745.3000. For groups of 20 or more, call the Hard Rock Box Office at 702.693.5220. For more information, visit www.supernaturalsantana.com. Showcasing the band’s career-spanning classics such as “Oye Como Va,” “Smooth,” “Black Magic Woman,” “Evil Ways” and “Maria Maria,” Supernatural Santana: A Trip Through The Hits takes fans on a multi-sensory journey through the most prolific Santana songs. Each show includes a unique take on the band’s repertoire to create a one-of-a-kind experience for show-goers. Fans can expect an ever-changing set list where no two shows are ever the same. The Supernatural Santana set was designed exclusively for The Joint, which was named “Best New Major Concert Venue” by Pollstar Magazine. Supernatural Santana: A Trip Through The Hits is produced by AEG Live.